Welcome to our technical blog. This blog is follow-up to our previous blog where brief introduction of flexible pipeline structure was discussed. Due to the complicated and composite structure of the flexible pipe wall, a large number of failure modes are possible. In this blog, a brief description and causes of various failures, which imply loss of layer function, is discussed. Cause : Carcass is subjected to collapse due to excessive pressure difference across carcass wall induced by pressure build up in annulus, rapid depressurization, gas release of dissolved gases in pressure sheath, hydrate melting in the wall or mechanical crushing. It shall be taken into account in design phase that wear, erosion or corrosion may lead to reduced collapse resistance. Cause : The most common cause for such failure is over-bending, excess tension or damages resulted by pigging. Cause : Carcass fatigue can be caused due to low cycle motions during shut down and high frequency vibrations in the carcass cavities (in gas import/export pipes). Stress corrosion resulting from high chloride fluid and pitting corrosion due to H2S in fluid could also lead to this failure. In some cases rapid melting of hydrates inside the carcass structure has also witnessed fracture. Cause : This is the most common failure witnessed in internal pressure sheath. Some of the causes are aging embrittlement of PA11 (hydrolysis), PVDF (deplasticization due to high temp. ), HDPE (oxidation), blistering, fatigue in polymer and excess creep of polymer into gaps between armours. Wear due to abrasion between pressure sheath and carcass or pressure armour is also a common cause of this failure. Cause : In smooth bore pipes pressure sheath can be subjected to collapse in similar phenomenon as explained in carcass section. For rough bore pipes collapse of pressure sheath is associated with carcass failure. Cause : Individual or multiple wire of armour may fail due to hydrogen induced cracking (HIC) or sulfide stress cracking (SSC) if high H2S levels has not identified in the selection of sour service steel. Wire-to-wire wear, excessive internal pressure and failure of tensile armour to resist external pressure may also lead to wire rupture. Diffused CO2 in the water filled annulus can also lead to failure of pressure amour wire if not accounted in material selection. Cause : The potential cause could be overbending, excessing tension, impact or radial compression / torsion during installation. Cause : This failure mechanism is similar to as described above for pressure armour layer as both the layers are in the annulus section. However tensile layer may also fail due to oxygen corrosion resulting in sea water ingress combined with inadequate cathodic protection. Rupture from impact, fatigue and deformation from impacts can also lead to wire failures. Cause : The most common cause for such failure is excessing axial compression or overtwist (often during installation). Cause : This could be caused due to point contact, mishandling on-board vessel or stroke back before subsea tie-in during installation. Cause :This failure has been witnessed due to ageing, wear from excessing contact forces and clustering during the manufacturing process. Cause :Sometime insulation layer get crushed due to installation loads or external overpressure. Another known cause is flooded layer due to ingress of seawater due to rupture or hole in outer sheath. 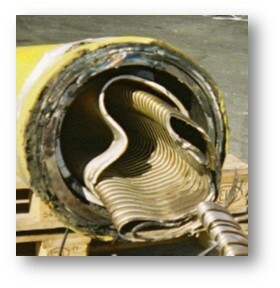 Cause : Failure of the outer sheath is most common failure mode witnessed in flexible pipes. The potential causes for such failure can be impact load, abrasion, excessing annulus pressure build-up, ageing embrittlement, polymer degradation or extrusion errors. Cause : Unlike rigid pipeline termination, flexible pipeline terminations are mounted (non-welded) on shore prior to installation. Internal pressure sheath which is clamped inside the end-fitting may pull-out due to polymer layer shrinkage or creep. Cause : Unlike rigid pipeline termination, flexible pipeline terminations are mounted (non-welded) on shore prior to installation. Internal pressure sheath which is clamped inside the end-fitting may pull-out due to epoxy degradation (sour service or high temp) or if the pipe experiences excessing axial tension. Cause : The most common cause of outer sheath pull out is polymer creep or excess annulus pressure build up. Cause : Vent valve at end-fitting could get blocked due to exit of annulus fluids, foreign fluids/particles from vent system. Corrosion is also one of the potential cause of it. Cause : Corrosion or seal failure is often the reason for vent valve leakage. Cause : This is one of most common cause of end-fitting failure which is often get detected during the FAT stage. This is usually caused by erroneous fabrication and mounting of end-fitting. The other possible reasons can be excessive internal pressure, tension or torsion. Very low internal temperature of transported fluid can also lead to failure of sealing system. Cause : This is usually caused by corrosion or chemical degradation from sea water either due to diminished anodes or broken external coating. The other possible reasons can be excessive internal pressure, tension or torsion. At Nobleseas, we possess key experience in design, analysis, fabrication, installation and failure modes of flexible pipelines and risers. Contact us should you need any support in flexible pipelines engineering. #Courtesy source : Some of the information has been sourced from literature and research work done by NTNU and SINTEF. Unbonded flexible pipe has been successfully used throughout the world to transport produced fluids from subsea oil & gas fields. From the deep waters offshore Brazil, to the hydrate forming low temperature conditions in West Africa, to the High Temperature/High Pressure (HT/HP) wells in the Gulf of Mexico and the North Sea, Far East Asia and Australia, flexible flowlines have adapted to every condition. Flexible pipe is extremely well suited for use in conjunction with Floating Production Storage Offloading (FPSO) vessels due to its ability to accommodate the dynamic nature of their positioning systems. FPSOs dominates the Floating Production Unit (FPU) market with a share of more than 60% among installed FPUs worldwide. Flexible pipelines are used for a range of functions such as oil and gas production and export, water injection, gas lift, drilling and well maintenance. Unbonded flexible pipeline is a multilayer construction where layers can slide over each other offering the flexibility while having required structural strength. The market for flexible pipelines is competitive and going through rapid technology advancement. There is little information available on flexible pipeline technology in the public domain as most of the work and research is performed in-house and as commissioned work through research institutes. In this blog different layers of a typical flexible pipeline are briefly explained with respect to function and structure. The carcass is made from stainless steel strip in a continuous manner onto a mandrel. The steel grade is based is compatible to the fluid composition of the transported stream. Pressure sheath or liner is a sealing layer made of polymer and continuously extruded over carcass. For dynamic application a multi-layer liner used for provide protection against metallic layers. The primary function of liner is make pipe leak proof. The major criterion for selection of liner material is the design temperature of flowing stream. Pressure armour, also known as pressure vault by one of the supplier is commonly made of carbon steel strips. The interlocking of the pressure armour is a limiting factor for the minimum bending radius of the flexible. 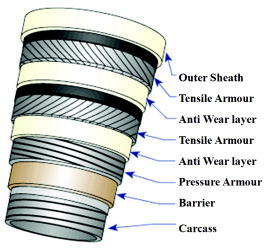 The tensile armour is two or four counter-wounded layers of armour w ire and provides strength against axial stress caused by internal pressure and external loads. In addition it also provides torsional strength to the pipe. The armour needs to be designed for annulus flooded with seawater. Anti-ware tapes are used in dynamic riser applications where steel armours are subjected to wear due to cyclic bending. The main function of fabric layer is to prevent disorganization of armour layers due bird caging, lateral bucking and torsional loading. The function of insulation layer of foam is to maintain the temperature of the internal fluid above the specified temperature for the critical time duration. The function of the outer sheath is to provide a seal against sea water to prevent corrosion and to give mechanical protection to the steel armour. It also acts external barrier to diffused gas. Similar to internal liner, outer sheath is extruded thermoplastic material. Additional layers can be applied onto specific section of outer sheath depending on requirements such fire protection layer, abrasion protection layer etc. At Nobleseas, we possess key experience in design, analysis, fabrication, installation and failure modes of flexible pipelines. Contact us should you need any support in flexible pipelines engineering. In the follow-up blog we will discuss about various failure modes related to function and material properties of each layer of flexible pipeline structure. Happy reading! Trip of topside separator or high liquid carry over from slug catchers in onshore receiving terminals caused by surge in liquids/solids and related production deferment. Potential of stuck pig in offshore pipeline. Formation of hydrates as a result of stuck pig in subsea pipelines have also been reported which caused significant production losses. Deep water developments continue to increase these challenges. To minimise these risks bypass pigs have been used by spreading the collected liquids and scrapped solids in front of the pig. However bypass pigging operations involves complicated fluid dynamics and limited success have been reported for predicting the slug size and duration for these operations. A typical bypass pig is shown below. It usually has openings in it which run from the back to the front. Figure 1 shows two different configurations. On the left, a pig is shown with a metal body that is open in the centre creating a bypass. A deflector plate is attached to the front of this metal body. The picture on the right shows a bypass pig with four holes (of which two are visible) drilled on the circumference. The holes allow flow through the pig from the high pressure side of the pig (behind the pig) to the low pressure side (in front of the pig) (Figure-2). As flow is bypassed, the pig velocity is reduced (compared to a standard pig without any holes) and pig travel time is increased. It may be noted that during bypass pigging, nothing (gas, liquid and solids) are left behind the pig and everything is pushed out of pipeline. Typical impact of bypass area on pig velocity (for various friction factors) is shown in Figure-3. As a result of reduced pig velocity, total travel time for a bypass pig significantly increases compared to a standard (no bypass) pig. Figure-4 shows typical trends in increasing pig travel time for bypass pigs (for various friction factors). Figure 5 shows the difference in slug lengths (liquid that is accumulating in front of the pig) for a standard and a bypass pig. The total amount of liquid that is accumulated is the same in both cases. The slug in front of the bypass pig is spread out over a larger distance. 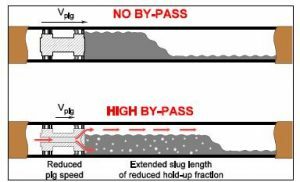 As a result of the differences in slug lengths, peak slug volume received at the topside separator or onshore slug catcher is considerably reduced for bypass pigs (lower peak liquid outflow rate and longer time duration in which the slug comes out). Figure-5 shows a typical trend for a slug catcher receiving feed from a large dia (36”), long distance (100km+) offshore pipeline for a standard and a bypass pig (with different bypass areas). For wax removal applications, a standard pig dislodges wax in the pipeline, creates a solid body of wax in front of the pig which then gets compressed and forms a solid plug. The plug formation leads to increasing frictional forces between the wax plug and the pipe wall. Experimental data shows that the force for removal of wax deposition can be the most important factor and, sometimes, the only responsible factor for pig stall. Bypass pigs allow the driving oil to flow through the mandrel or through holes in the scraping discs. When a bypass pig is launched, all wax will still be collected, but because there is a bypass flow, instead of a plug, the wax cuttings are transported in the form of wax slurry (Figure-7). This lowers the risk of getting the pig stuck due to a wax plug and allows for less wax to arrive in the pig receiver. A large portion of the wax ends up as part of the wax slurry in the processing facilities. Following important Engineering parameters are required to be considered for bypass pigging. For green field applications, sizing of a slug catcher (or topside separator) is considerably impacted by peak liquid volume expected during pigging (sometimes the governing factor). Possibility of applying bypass pigs should be explored which can favourably offer capital cost savings. For brownfield applications where slug catcher (or topside separator) size is already fixed, vessel size, liquid drain rates and available level control limits should be considered for selecting the bypass size. While the risk of getting a pig stuck inside a pipeline depends on many factors (pipeline conditions, flow characteristics and flow rates etc. ), for identical pipeline and flow conditions bypass pigs with larger bypass sizes pose greater risks. Industry recommended bypass pig velocity ranges between 1-5m/s. Lower velocity can potentially lead to pig stall (however industry experiences exist for pig velocity of <1m/s). Suitable care should also be taken for selection of suitable friction model. For wax cleaning applications, minimum bypass port size is usually governed by the considerations of creating enough bypass flow to fluidize the wax debris and push them forward (typically 2-3%). It is also governed by the condition of not getting it blocked by wax debris (minimum port size recommended). Similarly maximum bypass port size is governed by the considerations of the minimum force required to move the pig forward and not getting it stalled. Bypass pigs are not suitable for corrosion batch runs (liquid batch will not be continuous when gas passes through the pig). Smaller equipment sizes required for liquid management during pigging and reduction of production deferment, both during inspection runs and solid/liquid cleaning operations. 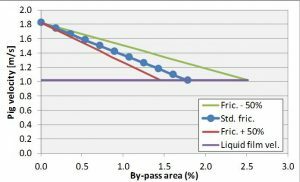 Improvements in the ease of processing of the fluids in the downstream facilities. Slowing down the velocity to avoid damage to the pig. Possible reduction in the pigging frequency. How can we reduce the costly material, life cycle and installation cost of subsea hardware, flowlines and risers? Is reusability and composites are the way forward? Industrial use of composites in which plastics are combined with other materials for added strength, flexibility, fatigue resistance or other desired properties is relatively matured in sectors such as aerospace. The Boeing 787 Dreamliner aircraft is a complete composite structure, for example. In oil and gas, the past decade has seen a rapid advance in the qualification and application of thermoplastic composite pipe (TCP) to counter inherent drawbacks of steel: corrosion, fatigue and weight. Of respondents to a DNV GL survey of industry leaders, 57% see a need for cheaper, more effective pipeline material in general, while the average cost of installing and maintaining a pipeline accounts for around 35% of a typical subsea tie-back project. In today’s cost control climate, the industry now views TCP as a viable alternative to steel across project lifecycles. A growing variety of applications offshore include flowlines, risers, jumpers, expansion spools, and lines for uses such as access, chemical injection, choke and kill, commissioning and intervention. Magma is already involved in first efforts to qualify TCPs following DNV GL’s Recommended Practice DNVGL-RP-F119 Thermoplastic composite pipes (2015) to assure performance, reliability and safety during a product’s lifetime.